To begin, you could start with Henry Lovewell Lutts, born in Kittery, Maine, in 1849. He was a self-employed housebuilder by trade, and the houses on Lutts Avenue in Kittery stand as a reminder of his work. Later in life, Henry built houses in New Hampshire and Massachusetts, typically moving into one once the roof was on and selling it when he could move into his next one. His second son was Carlton Gardner Lutts. Thanks to his father’s occupation, Carlton moved 26 times as a child. But he was bright! An inventor and entrepreneur; he started businesses making and selling jigsaw puzzles and chemically treated paper roses that forecast the weather. But those were just sidelines. Carlton was a metallurgist by trade; he worked at the Boston Naval Shipyard and had patents on methods of chain manufacture that brought in royalties. His wife, Grace Alberta Smith of Salem, had a “money mind” from the start. She bought her first house at age 19, with her own savings, over the objections of the bankers who were unaccustomed to dealing with single young women. She and Carlton had three children. And in 1941, at Grace’s urging, they used the chain patent royalties to buy the old Cabot Farm in Salem, a 28-acre property that currently is home to roughly 30 members of the Lutts family. Grace was a lifelong investor in stocks, favoring the buy-and-hold method. Their second son, Carlton Gardner Lutts Jr., was trained as an engineer, but his love was the stock market. In 1970, driven by a desire to share his thoughts on stock selection and market timing, he began writing and publishing the Cabot Market Letter (named after the farm) on the proverbial kitchen table. As the years passed, his homespun wisdom and irrepressible passion helped hundreds of thousands of investors build big profits in great growth stocks like Fleetwood, WD-40, American Medical and Syntex. The Cabot Market Letter, now award-winning Cabot Growth Investor, is published to this day, bringing market insights and investment recommendations to subscribers around the world. 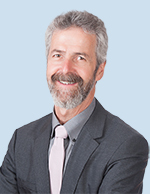 Carlton’s first son, Timothy, joined the Cabot publishing business in 1986 to contribute advice on investing in mutual funds, which were then enjoying a boom. As time went by, Timothy filled the Cabot stable with experts on value investing, international investing, options investing, dividend investing, small-cap investing and more. He also serves as Chief Analyst for Cabot Marijuana Investor and Cabot Stock of the Week. Carlton’s other sons also have the entrepreneurial spirit. Second son, Robert, founded a money management firm in 1983 and third son, Andrew, launched the Internet service company Net Atlantic in 1995. Meanwhile, at Cabot, Carlton and Timothy worked side-by-side for 18 years, transitioning the business into the digital age while remaining focused on the goal of serving subscribers with the best independent investment advice possible. Carlton passed away in 2012, but his spirit lives on at Cabot, where Timothy and the entire staff are dedicated to providing investment advice you can trust, year after year, decade after decade. 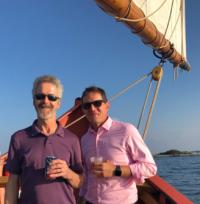 Left to right: Timothy Lutts and Ed Coburn sailing in Salem harbor. In 2018, Ed Coburn joined Cabot as President. Previously Ed has run several publishing and media businesses, including Harvard Health Publications, the publishing division of Harvard Medical School. Ed comes from a long line of bankers and investors – his father was Director of Research for the oldest investment advisory publication in the country, Babson United Investment Report (now closed), and his grandfather managed the investment of pension funds for major corporations, including General Motors among others. “Thanks ever so much for your helpful reply. This is what is so unique (well, one of the things) about Cabot. I recommend you guys to everyone!"